In class, many of the students I work with are encouraged to "have a go" at spelling words that they aren't sure how to spell. Often this happens when they have spelt a word incorrectly in their first draft of a piece of written work. The teacher then points out the error, but doesn't correct it. Instead, the student is encouraged to problem-solve the spelling, by asking classmates, trying to sound it out, thinking about word families or similar words, or looking it up in a dictionary. 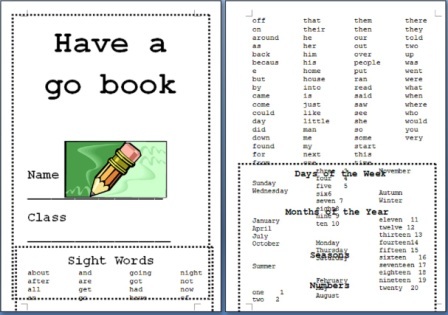 The remaining pages have three columns: one for the word as misspelt, one for the student's "go" and one for the correct spelling as checked by an adult. It's lovely that someone has made up a spelling resource and is prepared to share it with others. 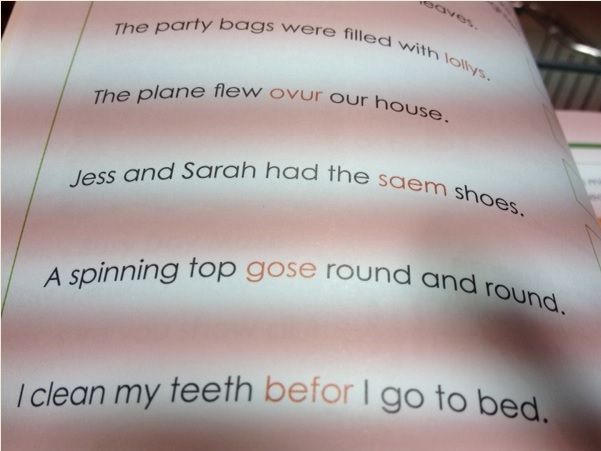 However, I have a big problem with this approach insofar as it encourages children to look at misspelt words (in the first column), then gives them a second opportunity to misspell them, and look at that mistake too, before seeing the correct spelling. So, if a student misspelt the word "embarrassment", the teacher would point this out and ask the student to go away and have a go at fixing it. A peer might suggest "embarassment" or "embarrasment", which is close, but no cigar. Sounding it out won't help much with the unstressed vowel sounds or the double letters, and could produce "imbarismint", "imbarasmant", "imbaresmunt", "imbarusmunt", "embarasmint", "embarasment", "embarassmunt" and so on, a whole cacaphony of possibilities. Scribes hundreds of years ago used to spell some words dozens of different ways, depending on their accent and preferences, which led to lots of confusion, and thus to the creation of the dictionary and standardised spelling. Word patterns and families might help you if you already know "embarass" and the suffix "ment". But if you try to get to "embarrass" by analogy with words with similar endings like "terrace" or ""Paris", you'll get "embarrace" or "embaris". If you analogise from "peppermint" or "claimant" you might write "embarrassmint" or "embarrassmant". To find "embarrassment" in the dictionary, you have to know that the first sound is "e" not "i", the second one is "m" not "n" (lots of kids say "enbarassment" until they know how to spell this word) and so on, and you have to have a good grasp of how words are arranged in alphabetical order. The students I work with are more likely to practise additional mistakes using a "have-a-go" book than they are to learn anything useful about spelling. Try misspelling a longish word a few different but phonetically plausible ways, and then looking at these misspellings for a little while. After I'd done all the above messing around with the spelling of the word "embarrassment", I really did have to get my Concise Oxford down from the shelf and check what was correct. Reading incorrectly-spelt words adds to the likelihood that you'll remember these mistakes, and thereafter be confused. It doesn't help you spell correctly. So have-a-go books are something I'm always keen for my low-progress readers and spellers not to use. I can hardly think of anything more likely to help a student make spelling mistakes. It would also give the school bullies one less thing to tease the little kids and the poor spellers about (though often the school bullies are poor readers and spellers themselves). Even very little kids are usually aware that spelling is an exacting not a creative pursuit (except in the culinary world – hommos, hoummous, hummus, rocket, roquette etc), and that most words only have one correct spelling. They are keen to spell words correctly, and to fix up mistakes. I agree with them, and think we should be helping them spell the words on their work correctly putting their work on display. They can still be creative with their colours, pictures, layout and other things which are creative pursuits. I wouldn't want my mistakes put up on the wall for everyone to see. This entry was posted in hard words, literacy problems, misspellings, spellings, teaching strategies, word attack on May 10, 2014 by alison. I totally agree (as usual) with all that you have written here about 'have a go' spelling. Further, teachers are often fearful of correcting children's spellings as if they have done something wrong – so the marking of spelling is often very weak or non-existent. 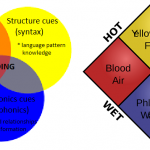 If teachers teach children all about the history of the English language – both spoken and written – and the world's most complex alphabetic code that we have ended up with – then incorrect spellings would be fully understood as a product of the history of the language, and the complex alphabetic code – and not as a 'fault' of the learner. Then, when either pupil or adult needs to consider the spelling of specific words, the sounds can be identified all-through-the-spoken-word (oral segmenting) followed by reference to the chart – find the 'sound' and then follow the graphemes (letters and letter groups) to the spelling alternative needed for the particular word. The whole ethos of spelling, then, is moved away from the capabilities (or otherwise) of the individual pupil – and placed on the reality of the situation which IS the history of the English language and the resulting complex alphabetic code! As can be seen from the poster, the language for parent or teacher is simply, "Let me help you with that word". Very unthreatening and focusing on accurate spelling at all times. Hi! Thanks so much for posting this! My eldest started school this year and I love to help out in class as a volunteer parent. 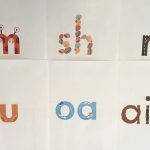 I was recently involved in a writing session where the children were encouraged to 'have a go', with the emphasis on trying to write the correct sounds that matched the words they wanted to use. For example, if they wrote, 'I wnt in thu cr' (I went in the car), all the words were ticked/given a stamp/praised without correction, as the idea was to encourage writing and sound-letter matching (as opposed to spelling 'car' using the letters 'xpf', which would be completely off the mark for the spelling of the word). This REALLY irked me. Yes, I understand the reasoning behind the approach, but surely we should be allowed to correct those mistakes (even by just writing it correctly above the mistake/s and explaining the 'ar' sound & spelling, etc). 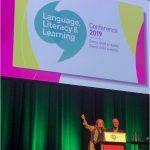 Also, some children didn't even know how to correctly pronounce the words they wanted to write (one little one insisted that she rode her 'sgoota' on the weekend, so she was never going to get the 'sc' at the start of that word without anyone telling her how it's actually pronounced). Since this happened last week, I've been desperately searching online for resources and information on how to effectively teach spelling with beginning writers. I'm mindful of the fact that these 5-year-olds need to undertake individual writing tasks at school, but what are some effective methods for enabling each child to write about their own experiences yet still be guided to spell correctly? It's one thing for them to spell CVCs using the method I saw in the classroom, but not every word a child wants to write is going to be a CVC. I'm concerned that my keen and able little writer will go backwards in her spelling if things are left to continue as they are. Fortunately for her, I can help at home with one-on-one attention and explanation. But what about all the other little kiddies in the class? Do you have any ideas on the best strategies to teach classes (or small groups within the class) how to spell correctly within the context of independent writing? Are the alphabetic code charts mentioned by Debbie suitable for all ability levels for little kids of this age (5)? (I think it would definitely be beyond most in the class). They are building a Word Wall, gradually adding new words during modelled writing, etc, but I'm not sure this is enough. Hi Kim, not being a primary teacher I find it a little hard to give out advice on this, but I suppose I’d query how important it is in the very early stages for children to do independent creative writing. For a lot of them, just getting letters and words onto a page is a big achievement, and it seems to me that they are not the ones insisting that they write about authentic personal experiences, it’s the educational system that insists on this. I think the school system undervalues word-level work, and that real beginners are generally happy and excited to just write words and get them correct, never mind about sentences. I was working with a couple of little Grade 1 boys this week who have been struggling with literacy but seem to have finally cracked the basic code, and they had a little self-initiated competition to fill a whole page up with words, and kept asking me to give them more words to write, and to make them more difficult – they were really quite hilarious racing each other to write long lists, and getting almost all of them right first try. Cracking the code is a brilliant achievement in itself. 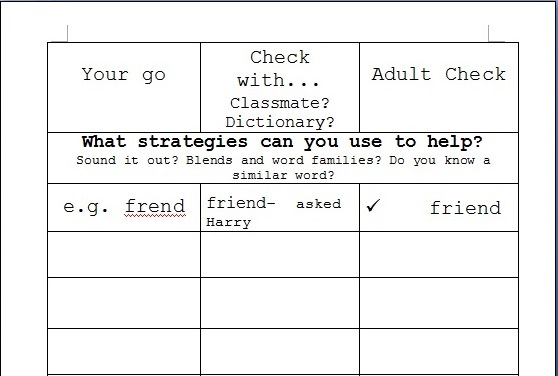 If children need to write about authentic personal experiences, perhaps the teacher could choose a different child or few children each day who have something especially exciting to talk about (making sure everyone gets a turn), write this out, and then the whole class could copy and illustrate it. That way everyone gets to share their experiences, and write about something interesting and authentic, but nobody is left practicing mistakes or staring at a blank page. Often little children don’t have much idea what to write when asked for a personal story anyway, in my experience, and are very happy copying something formulated in a bit of discussion with an adult. I know that it’s not possible for a class teacher to write out something personal for every child, but writing out up to four or five different sentences or very short paragraphs shouldn’t be too onerous. Children in my class ( year 1) came to me with a palpable fear of misspelling words, using the wrong sounds within words etc., etc. Now if it was one child with this problem it would be simple enough to go through sounds with them but it is the entire class. They hated writing. Should we not be encouraging children to put pen to paper and encourage independence and creative flow, especially in the early years? In your view, is it not more important that you recieve a class that know what vocabulary to use to engage a reader and can get that down on paper, regardless of the correct spelling? I’m a spellings and grammar fiend… Now I’m 25. But if their fear of getting spelling wrong stops them from even trying, is this not the role phonics plays, where they can get their ideas on paper, readable though technically incorrect? Children learn to say words before they say sentences, and I think kids should be asked to write words in fairly structured activities before they are asked to write sentences. Schools tend to leap straight from writing nothing to trying to write sentences and little personal narratives, and that jump is just too great for many kids. Once kids have done enough successful word study using the Basic Code then they of course start wanting to write sentences about what they have been doing or imaginary things, and then you can use a chart of all the sounds and their spellings to help them fix mistakes, for example if they want to write “rain” but you haven’t taught “ai” yet, you can just say “oh, good try, let me show you, rain uses this spelling for the ay sound, we haven’t done it yet” and point to “ai” on the chart. I would never discourage children from writing what they want to write, but I would like teachers to help children fix the spelling mistakes they make rather than ignoring them and putting them up on the wall for other children to learn too. The classroom narrative should be that making mistakes is a part of learning, they show you’re going out of your comfort zone and having a go, which is great, but when we make them we notice them and fix them up, and then we know how to do that word next time, and we don’t practice making the same mistake. 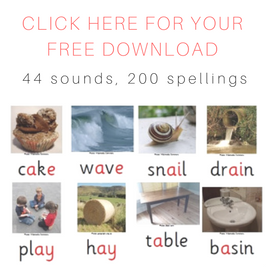 Here’s a good handout from an experienced teacher that talks about both teaching systematic and incidental phonics, so that you’re making sure you work your way through the spelling system and teach them the code properly, but also allowing children to use writing to express themselves. Re copying, I think it has a place in early letter formation but there are plenty of other activities apart from open-ended personal writing that children can use to practice writing e.g. 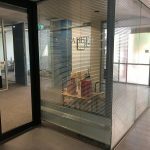 cloze activities, labelling pictures, crosswords etc etc. 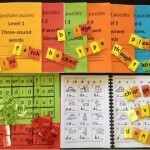 Have a look at good synthetic phonics programs for the huge variety of activities they use. Very young children can still express themselves in a personal sense orally, until they have enough of the spelling code under their belts to do it in writing. Hope that’s helpful, but if it’s not please let’s continue this conversation. I’m not a primary school classroom teacher so you have direct experience that I don’t have. 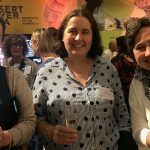 I am a fairly new primary teacher- with a secondary background. If I tried to correct all of the spelling on students’ work, it would be covered in red. I think I agree with you Alison that we are attempting many things for students when they are not yet ready for them, and so if there was less writing for me to correct then that would be less of an issue. There has been research though that students do not retain corrections regardless and that it is a waste of time. What is your view on this? I am teaching grade 3/4 this year and I am looking for a good place to start. I assume one of your spelling tests that includes made up words, and then be guided by the results as to which of your books to use? Hi Jude, I think the timing of feedback really matters, if it’s immediate or prompt, while the task is still relevant it’s more valuable than gathering up work, correcting it and giving it back days later when students have forgotten what they’ve written, or may have practised the error multiple times. But I must say that I am not 100% across research on the best way to deal with spelling errors, I must look into this in more detail. One problem with spelling is that whether you spell the word “elephant” as “sgoemsiogns” or “elefant”, you still get 0 on a spelling test, it’s only correct when it is 100% correct, but kids don’t always get the trickier spellings 100%. I like to work through a word and tick each PGC/GPC that’s correct and then when I get to the “f” in elephant I can say “you’ve got the right sound but in this word we spell it with ph”. But that’s easy for me to say, I mostly work with students 1:1. I know it’s much harder in a classroom, but it really does bother me that kids are encouraged to try to write things they can’t yet write, read things they can’t yet read and to admire the uncorrected work of peers to the point where some are totally confused. I think kids can do creative writing when they have learnt the basic code/alphabet and a few digraphs, but they need an adult to give them the spellings of tricky words. My son’s kindergarten teacher gets the class to write a diary entry each Monday about the weekend. They each write the entry first on their whiteboards, the teacher corrects the spelling, and then they write the correctly spelled sentences into their books. Immediate feedback, they value correct spelling and they still get to be expressive and creative. I love the approach.